Rescue efforts continue in Mozambique and Zimbabwe following the devastating cyclone Idai.
.@UN agencies have set up base @PlanZimbabwe offices in #Mutare to ensure smooth #InterAgency networking for the #CycloneIdai response. Mozambique on Wednesday began three days of national mourning for more than 200 victims of Cyclone Idai, one of the most destructive storms southern Africa has experienced in decades. The full extent of the devastation will only be known once floodwaters from torrential rains, expected to continue into Thursday, recede. It will be days before Mozambique's inundated plains drain toward the Indian Ocean, and aid groups have warned the waters are still rising. A radar satellite image shows that a large body of water continues to flood the area around Beira in Mozambique - five days after Cyclone Idai made landfall. - Will the death toll rise? - What is being done to help? 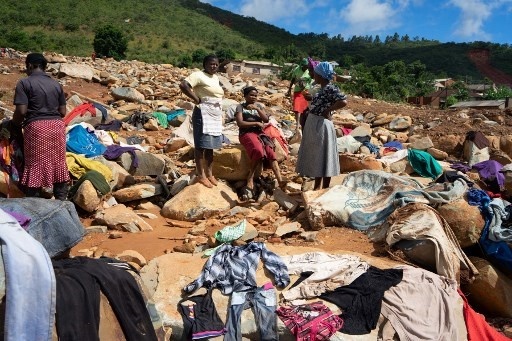 Zimbabwe is retrieving and burying bodies on Wednesday as Mozambique begins three days of national mourning for victims of Cyclone Idai. More than 2.6 million people were affected.